The non-self-propelled vessels (NBL-91 project) will transport general and bulk cargoes in Ukrainian inland waterways. Image courtesy of NIBULON. The non-self-propelled vessel features two total cargo holds that offer a storage capacity of 5,050m³. Image courtesy of NIBULON. The non-self-propelled vessels (NBL-91 project) are under construction at NIBULON shipbuilding and repair yard. Image courtesy of NIBULON. The non-self-propelled vessel is towed by the POSS-120 Pushtug. Image courtesy of NIBULON. The non-self-propelled vessels (NBL-91 project) are a series of 12 barges being built by NIBULON shipbuilding and repair yard, which is based in Ukraine. The vessels are intended to transport cargoes along the Southern Bug and other shallow rivers in Ukraine. The construction of NBL-91 project non-self-propelled vessels is a part of NIBULON’s investment programme to develop a new logistics system that will revitalise the Southern Bug inland waterway. NIBULON also plans to build 12 shallow-draft pusher tugs and 35 Volga-Don Max Class self-propelled vessels to support its inland water transport services across Dnieper, Southern Bug, Desna and other rivers in Ukraine. The NBL91 non-self-propelled vessel was designed by POSS Torola. It is based on its predecessor, NBL90. The detailed design documentation of POSS-120 and NBL-91 Projects was handed over to The Shipping Register of Ukraine in March 2011. The M/T Stolt Sagaland is the latest addition to the fleet of Stolt-Nielsen, a Dutch shipping company based in Rotterdam. The NBL-91 construction involves the participation of 340 Ukrainian suppliers. 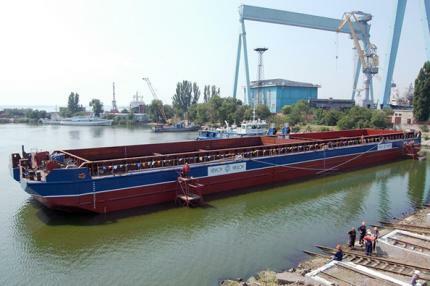 The first steel for the construction of three non-self-propelled vessels was delivered in early 2015 to Pallada State Plant (Kherson), which produces parts for the non-self-propelled barges. The production of flat plates for three vessels began in February 2015, while the installation of plates for the second and third segments of the first vessel was concluded in March 2015. The hull section assembly for the first vessel was completed by June 2015. The primary painting and assembling of deck and electrical equipment of the first vessel were successfully completed prior to its launch in August 2015. The second vessel is expected to be lunched in the second half of 2015. "The second vessel is expected to be lunched in the second half of 2015." The advanced design offers an eased hatchway cover and smaller draft. The vessel integrates simplified hull lines without superstructure and propulsion gear. The hull structures comply with the MAKO 47-2 (2004) standard. The main hull is made of Grade A and D carbon shipbuilding steel. The shipbuilding steel, which is used to construct the hull, is produced under the supervision of the Shipping Register of Ukraine and meets the regulations of the authority. The vessel has a length of 90m, breadth of 16m and moulded breadth of 16.22m. The loaded draught and depth of the barge are 2.7m and 4.2m respectively. The displacement of the barge is 3,750t and the total cargo hold capacity is 5,050m³. The vessel is designed to transport general and bulk cargoes. Two cargo holds are fitted with lighter hatches for easy loading and off-loading of cargo to/from the vessel. "The vessel is designed to transport general and bulk cargoes." The non-self-propelled vessel will be accompanied by the POSS-120 Pushtug designed by POSS Torola. The single-deck tug is powered by two high-speed non-reversible four-stroke diesel engines, which develop a maximum continuous power of 438kW each. The engines drive two full rudder-propellers through a twin-shaft. The POSS-120 tug has a length of 18m, breadth of 8.3m and draught of 1.5m. The Pushtug supports mooring missions and can push or tow non-propelled vessels or group of barges or floating structures. It will function as a harbour tug and will also be capable of breaking ice in winter. The 1,000hp-class inland tug also performs operations in the reservoirs and at the passages of the locks. It can tow independent non-self-propelled vessels at an average speed of 4kt. The vessel has a maximum endurance of five days.